It seems like these days a lot of people have their own version of homemade laundry soap. And I think it’s great! Many people are beginning to realize just how frugal it is to make your own. We’re talking pennies per load! Throughout my laundry soap making journey, I have been through several different powder, and liquid, detergent recipes. I’ve tried so many different combinations of things. Some I liked…some not so much. *Most of these items should be found on the laundry aisle in your grocery store. *I also like to get creative with essential oils, if I have them on hand. Having to remember to buy and stock only these items helps me tremendously! This way, I know I will have what I need, when I need it, in order to make any cleaning product I run out of. -Optional: lavender, sweet orange, or your favorite essential oils. On medium-high heat, in a large pot, simmer 1 quart of pure water along with the grated castile soap, stirring continuously, until melted. Do not allow to boil. Remove pot from heat and add remaining ingredients stirring vigorously until completely dissolved. Pour contents of pot into a 5 gallon bucket and begin to slowly add 2 gallons of pure water while continuing to stir. Let laundry soap sit for 24 hours prior to use (this allows it to thicken). Use 1/4-1/2 cup of laundry soap per load. -After the 24 hour thickening period, you may use a funnel to transfer soap into alternative storage bottles, i.e. old milk jugs, old laundry detergent bottles. I keep mine in the bucket, it’s just easier for me. -I prefer liquid to powder for one main reason. With the liquid soap everything is already dissolved so I can run the washing cycle with cold water. Whereas with the powder, I had to use warm or hot water to be sure that the powder soap dissolved and did it’s job. -This is a low suds recipe. Therefore, it works just as well as your high-efficiency laundry detergents found in the store. -You may find, after the soap has cooled, that it is to thick for your liking. Go ahead and add water slowly until your desired consistency is reached. Not to much though; it’s supposed to be gel-like. -For the brightest laundry, pour white vinegar in fabric softener compartment with each load (I promise your clothes will not smell like vinegar and you’ll love the results). Don’t forget to share this recipe with others; and please leave us a comment about your laundry soap making endeavors so we can all learn from each other. Homemade Liquid Dish Soap - That really works! i found you on tip junkie…i also make my own detergent…can you tell me where you get your essential oils? The Herb Store (yes, that’s its name) in Albuquerque also does mail order. Its catalogue is available on-line. It is locally owned, carries a huge selection of bulk and packaged carrier oils and several brands of essential and fragrance oils. Some of the dried herbs are a bit pricey, but absolutely top-quality and many are available in lower cost non-organic form as well as organic. They also carry vitamins, hard-to-find supplements, a good number or empty cosmetic containers, some organic clothing, candles, etc. Buy Essential Oils from GREAT AMERICAN NATURAL PRODUCTS in St. Petersburg, Florida. They have more oils than anybody anywhere. Mail order and best prices I’ve found. I usually get my essential oils from a local health food store but I really like to order online from Mountain Rose Herbs. They have a really good selection and their prices are good too. I noticed that Mountain Rose Herbals has a “natural source cosmetic grade Sodium Borate that does not contain surfactants and detergents which are commonly found in commercial Borax products.” Is this the Borax you use, because I’ve read on other blogs that Borax might not be so good for you nor green – although I’d wager that the type from MRH would be much better, and only (as of June 2012) $12 for 5lbs. I have been wanting to do this for a REALLY long time. We have an h.e. washer and I'm so afraid of messing it up. There is warnings all over it saying that you MUST use special "h.e" detergent. Thoughts? Do you know of others that have made their own with h.e. washers? @Angela This is a great question and genuine concern a lot of people have. I have been using this recipe for a while now in my HE washer. I have never had a problem. HE detergents sold in the stores are simply low-suds formulas. And this, I assure you, is a very low-suds soap. None of the ingredients produce a lot of what some consider "soapy action" (suds). I know several people who use my recipe and they all have HE washers. No one has ever mentioned having a problem. If you follow the recipe as given here, I can promise you will love the results. I have no electricity so I use a laundry plunger and cold well water to wash my laundry in tubs. The commercial stuff works fine, but has anyone used this soap with the washing method I use or will I be the (LOL) guinea pig on this one? The recipe I use does not include baking soda, just the washing soda. Is the baking soda necessary? I did not think to add baking soda to my laundry soap. I shall try that next time since I have little children and need all the help I can get removing stains also! I use a similar recipe and I have an HE washer that does fine with it. I've been using it for 2 years now. This saves me a lot of money and my family has sensitive skin so it's gentler than store bought detergent. I'll have to try the baking soda version as I have lots of stains to deal with. I order my bars of soap buckets and washing soda through Ace hardware because my grocery stores don't carry it. I use the funnel idea and store my soap in empty vinegar bottles undiluted and then dilute when I transfer it to the empty detergent bottle that I use. I don't add any scents to it since my family is sensitive to them. Thanks for your post! This was just what I needed.I am out of laundry detergent. I have all the ingredients except a bar of castile soap. I do have a bottle of the liquid castile. I now know how much liquid castile to use. I think I missed the post with how much liquid castile soap to use. Would someone please post it again? did anyone add that post – would love to know how much liquid castille to use – thanks. If you are using the liquid castile soap, do you still need to heat it or can you just add everything in the bucket? @AmyMom6 Great question! I still heat it simply to dissolve the baking soda and borax. 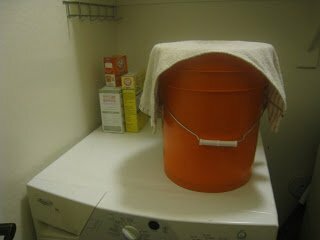 Has anyone come up with a homemade liquid softener? Sometimes I use dryer balls, but since I use unscented detergent (until I use it up and try your laundry soap) I would still like to have a light scent so I use a commercial softener. I've heard hair conditioner works, but that's not cheaper and is still full of chemicals. there is a recipe out there for liquid softener. I can not remember the web site i found it on when exploring laundry soap recipes. Google it. Im sure it will pull it up! Vinegar is the best liquid softener – cheap, soft, and does not leave a smell! does anyone know if this is ok to use on cloth diapers? I had heard the borax leaves a residue that causes burns on baby skin when they pee. I would love to use this for my diapers if it will not hurt my baby. Thanks. To eliminate the problem with borax in the diapers, simply rinse them a second time with white vinegar in the water (a 1/2 cup should do it). The vinegar helps cut any residue and the second rinsing helps to eliminate even more stains. You cannot use vinegar with cloth diapers, as it will ruin the waterproof fabric of the diaper. I didn’t know they made waterproof diapers. Made this laundry soap and I can't wait to try it. I also made the hand soap since I had all the ingredients. Love it. Perfect timing too. I just ran out of both soaps when I came across your blog. I saved tons of money and now I know what's in my soaps. What a blessing you are. I tried this recipe, and I think something (i.e., me, haha) messed up somewhere. I followed the instructions to the letter. I let it sit, covered with a towel, in my laundry room. After about 12 hrs, I went to go check on it. There was about a 2 inch layer of soap (like a really thick gel) sitting on top of about 2 gallons of semi-soapy water. It didn't look right, so I stirred it up. 24 hours later, I checked on it again. Now it's a 5 inch layer of really thick gel-ish soap sitting on top of a little less semi-soapy water. Do you know what might have happened? And (especially) if & how it can be fixed? @Laura T. Sometimes this happens:( I don't know why it happens but it does. But don't worry…its not your fault:) And, best part is you can still use it! It's perfectly good laundry soap even if it never gels. Just be sure to give it a good stir before using. -I'll give you one of my tricks for mixing the soap…I use a stick blender. It works wonders! And really gets everything dissolved and mixed together! Mine didn’t thicken, either. 🙁 But, I’m still using it and hoping for better results next time! I too have been using this basic recipe for a year or so (without the added baking soda), but my whites are very gray. Can you make any comments to that as to why or how to prevent this? I did not read all the above comments, so forgive me if someone else asked the same question, but I am assuming vinegar does not bleach/whiten colored clothes, is that right? So it's a color safe additive? I've been making my own detergent for years. Love it. I've always done powder, but think I will give liquid a try! 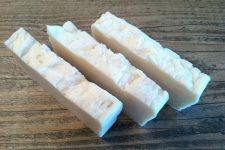 I like this–I’ve been doing my own soap for little over 6 months, and used fels naptha instead of castille (can’t find any bar but fels naptha here), and LOVE how it works out! I love the smell of fels, so I don’t use EO’s. I also use a washboard and line dry, even in winter, so I use a tad bit of softener (face it, it isn’t pretty being beat with a stiff towel or jean legs in the Kansas winds…those things fight hard!). Seriously tho, I’ve save like $20 a month just in soap for laundry, plus the cost we were putting out going to the laundrymat ($100 or so a month)…x 7 or 8 months already. I’ve spent under $20 in supplies for the soap in 6 months and made 2 full 5 gallon buckets PLUS (of extra thick concentrated stuff)…and have it in multiple containers as well. Totally worth the time and effort!! I Just made this recipe and I was very excited to try it out! I left it in my laundry room in the bucket since around this time yesterday… I was so sad to find that it didn’t gel one bit, and it had this layer on top of the liquid of something that looks like cottage cheese… I mixed it with the watery bottom layer and now I have a watery-cottage-cheese-like-mixture… What did I do wrong? I used a naphta bar of soap since I couldn’t find Castile. Paola…That happens to me sometimes too. I don’t know why? Just stir it in and use it anyway. I always do:) Btw, I use fels naptha also. I had this happen the first time also. The second time I made laundry soap I heated the water with the grated soap to almost boiling, also the additional soap needs to be almost boiling. Then stir from time to time as it cools. Also you want to make sure everything is dissolved before you add the additional water. I tired this and my laundry soap came out great the next time. I can’t wait to try this and the homemade bleach. I’ve been diagnosed with pulmonary fibrosis and have to avoid any harmful chemicals and smells like bleach has. I’ve gotten rid of all my old cleaners and am making my own or using Method brand. I’m hoping this works well for my autistic son since some detergents/softeners irritate him skin when they are on his clothes. Hey there! I was wondering if you can use liquid castile soap and how much do I use? This is very similar the recipe I use….except that my directions say to dilute the gelled soap with water using a 1:1 ratio. So my 5 gallons of gelled soap ends up making 10 gallons. I have felt like my current soap is not getting some loads clean and I wonder if my soap is too diluted? Just to clarify, you don’t dilute your 5 gallons of gelled soap (other than a tad water to help pour it)? Thanks!! I made this laundry soap 2 days ago. It did not gel like I was expecting it to. What did I do wrong? I used liquid lavender castile soap instead of the grated bar soap. I followed all the directions. The only thing I can think of is I used tap water. Does “pure water” mean distilled? And would that make a difference? Also I covered it during the 24 hrs it was supposed to sit and gel. Would that make a difference? 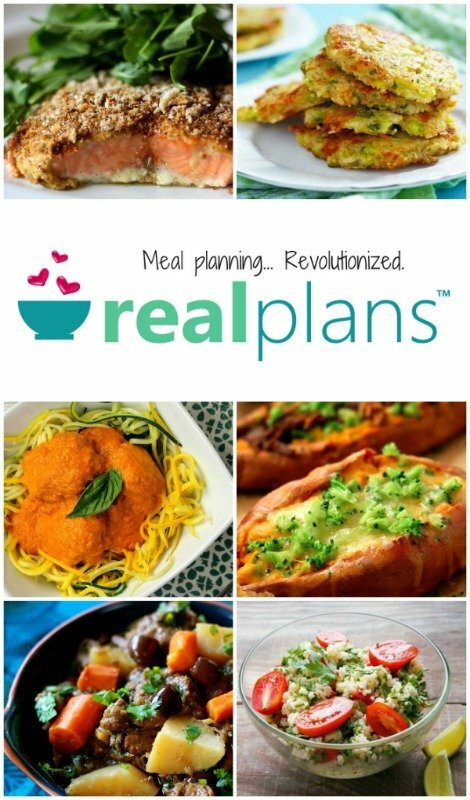 I just found your website and love it! I too have been making my own cleaning products & laundry detergent (liquid) for the past 3 years. I have always used Fels Naptha, but after doing some research, I really don’t like the fact that it is not a “natural” soap. So last night I switched it up and used a bar of Dr. Bronner’s Lavender castile soap. I know you are supposed to let it sit for 24 hours, but I made it last night around 10:00 and this morning it was a soapy-colored pure liquid mixture. The liquid was still warm as well. Usually when I make this, it would have gelled up overnight…I know above you say you can still use it if it doesn’t gel but it makes me nervous!! Do you need to use more since it is not a concentrated “glob!” or is the same amount effective? Any tips on how to thicken this up? I used the lavender soap because I love the smell and didnt want to mess with adding EO’s to the mix as sometimes I have notices it can leave somewhat of an oily residue. Any tips you have would be great! The bar of soap was like $4 so not super expensive, but I don’t want to waste it either!! Thank you!! Hello. I have an HE washer. I am afraid to use the white vinegar to brighten the load. If I used that on colored clothes wouldn’t that cause fading in th e clothes? mine did not gell either but works fine. try finding the castille soap in the beauty aisle. thats where i found mine– by the oil of olay soap. I add an extra 1/2 cup of washing soda to every load- just seems to make things cleaner and whites whiter. Love this soap! I use it in cold water mostly. for fabric softener, i use 1/2 cup white vinegar and 1/2 cup water in the softener dispenser. works great on colors. my hot tub towels have a funky smell so i throw in an extra 1/2 cup vinegar in the hot wash. seems to help. Thanks for posting! Hi I was wondering what bar of soap would be good for my little girl who has exezma to use in this recipe. I have been trying to use this laundry soap for about 1 month now and have been struggling with it. I feel like I’m doing something wrong since so many people have such good success with it. I have found a couple shirts where my baby spit up and after washing the spot turned to a greasy spot that was never removed and I had a couple incidences (a boppy pillow cover and changing pad cover) that came out with weird gray spots on them. I also have been using them on cloth diapers although I’ve been leery about it b/c of the debate on using soap vs. detergent on diapers but it does seem both kiddos are getting a little more redness to their hineys and the diapers are smelling more like ammonia than when I used Country Save. Any ideas/suggestions as to what I can do to improve? Also what is the measurement to use liquid castille soap in place of a bar of soap? Thanks! 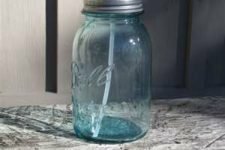 I made my own laundry soap for the first time a few weeks ago – but I just left it as a powder and I loved it! It worked amazingly well. However, just as you posted, I really don’t like having to use hot water in order to melt the grated bar if soap. Has anyone used liquid Dr. Bronner’s instead of a grated bar of soap? What amount of soap would I use? It just seems like that would save the whole cooking step. Let me know what you think. I have just whipped up a batch of this laundry soap and am waiting on the results. I have seen several similar recipes, including the Duggar family recipe. The main difference being the amount of water added to the final product. Your recipe appears to make about 2 1/2 gals of soap, but I’ve seen in another recipe where another 2 1/2 gals of water was added to make 5 gals of finished product and another recipe where you fill an old laudry detergent bottle 1/2 full of the 5 gal product and 1/2 with water, which would result in 10 gals of product, all from the same recipe. That seems to be quite a bit of diference and I am concerned about how much water I should actually use. They all suggest using 1/4-1/2 cup per load. What brand of castile soap do you reccommend? I’ve heard a lot about Dr. Bronners, but it seems kind of expensive. Has anyone used Kirk’s castile soap? I found it on Vitacost for 97 cents a bar. Way better than $4! I use Kirk’s because it’s all I can find where I live, but I do like it. 97 cents a bar? I think that is a good deal! 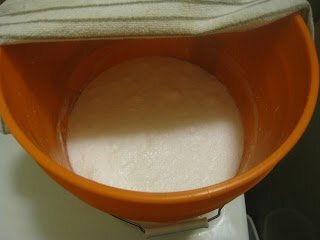 I made laundry soap with the fels naptha and loved it! Wanted to try a more natural bar, so yesterday used the castile bar. It has not gelled:( I was so excited about added some oils, but when I opened the lid it looked like it did yesterday 🙁 bummer. any suggestions? Finally trying to make my own laundry detergent. my large duggar family cousins do this so I am trying it. I have bought my natural products through a company online but it is getting expensive and I am doing my own 🙂 Thanks!! Where do you purchase your super washing soda? Is it the same thing as laundry soda? In your recipe I couldn’t find the amount of Vinegar? Or does it just go in the fabric softener thingy? Modern cloth nappy users – do not use vinegar in your wash or you will wreck your nappies. I’m just about to try this recipe. I’m in Australia so haven’t seen the soaps you’re talking about. We have been using dishwasher powder that I made a few weeks ago and it is working well. Our laundry detergent ran out today so I’m hoping this works. My kids love playing outside so it will get a thorough test. I really love your site….I have been making laundry soap for some time. For those with children with sensitive skin…or adults even, you can substitute Ivory bar soap for the fel naphtha, or even Dreft. I don’t bother with the essential oils…but I may start, because your site is so interesting. And vinegar…does NOT bleach out clothes, and I use white vinegar almost exclusively for fabric softening, works great and totally hypoallergenic. Was the only thing I could for a baby with hyper sensitive skin…her cloth diapers and baby clothes were soft and FRESH!!!! And the powdered version of laundry detergent I often make is so easy and works great on garden soiled clothes and grease stains. What recipe do you use for removing grease stains? I use cornstarch directly on grease or oil stains. You can cover with a kitchen towel or paper toweling…add a weight like a book. you would be amazed at how well this works…I saved one of my DH’s silk ties for church this way! On things that can be washed, once the grease is absorbed into the cornstarch…you can launder that item as usual. It may take several days and several applications…it did with his tie. Some ppl use babypowder…but talc is toxic in it’s own way and cornstarch I find works just as well. Bless you Elisa, that is exactly what I needed to know. I knew I couldn’t use Fel Naphtha but I didn’t know if there was a substitute. How much white vinegar? You mention it on your ingredient list, but below in the recipe list and instructions it does not show up. What is the maximum amount of water that can be added without diluting the cleaning pwer of the soap? I have an herb garden do you think it would work if I seeped my herbs (say lavender) for a while before making the soap instead of using essential oil ro do you think the scent would be too weak? I’ve made the bar type detergent and didn’t like it because it clumped. I do have liquid Castile soap…how much of this do I use? I can’t seem to find it in the recipe anywhere. Hi, I would really like to try a homemade laundry liquid/power but I am allergic to olive oil so all castile soaps are out, and I have never been able to use soap without irritating my skin, Is there a alternative that can be used? I don’t use castile soap in mine; I use cheap laundry soap which doesn’t contain olive oil (generic brand or Velvet brand). the soap should wash out completely so you shouldn’t have to worry about it irritating your skin, but you could put your cycle on extra rinse so you can be sure to rinse out the soap. What does one bar of grated soap equal? 1 CUP or more? I’ve found that one bar of grated soap equals about two cups. I have used a similiar recipe for about 6 months, without the vinegar.. but my husband has complained that his work shirts do not smell fresh for his whole shift. I am not sure how to fix this. I have thought of adding Tea tree essential oil to the orange and lemon that I usually add in hopes that it will disinfect a bit more. Any thoughts on how to eliminate this problem? in your recipe – it doesn’t say the amount of white vinegar, or did I miss it? Oops! I mispoke. There is none in this recipe. (I’ve been looking at so many cleaning recipes on-line I guess it just got a little fuddled in my brain.) I just add it to the rinse cycle. I’ve used my downy ball in the past, just fill it to the fill-line, but now I just put it in the designated softner spot on my machine. Sorry for the confusion. My husband and I made this a few weeks ago. It’s a little early yet to tell if I’m using the right amount with our hard water, but the clothes seem to come out smelling really good. It’s funny, having made our own soap I thought it also necessary to give my washer a “thorough” cleaning. It’s amazing how much . . . less unpleasurable:) it is to do laundry now. It also helps that I keep my laundry soap in a quart mason jar on the dryer. It’s so much prettier than the old vinegar and milk jug that currently house the extra soap. Thanks for the post!! I made this yesterday and let it sit for 24 hours and just checked on it. It seems as though all the ingredients rose to the top and water is sitting underneath it! That’s not suppose to happen, is it? Did I pour the two gallons of water two quickly and not stir enough? I really hope to hear from you. I really want to have my own homemade laundry soap! The clumping happened to me too Megan and I don’t know how to fix it. Since it is supposed to be a 100 degrees today I am leaving it in the sun in hopes that the top soap layer will melt and the clumps disperse. I’ll give it a stir once in awhile throughout the day – we’ll see what happens! The same thing happened to me…………it won’t be 24 hours till 9 or 10 pm but it is currently watery underneath as well. Could 2 gallons be too much for different water? Can I use liquid castille soap rather than the bar soap in this recipe? I’ve been making my own laundry soap for about 2 years now. I use a recipe similar to this but in powder form because it’s easier and faster to make and easier to store. my recipe is 2 cups grated laundry soap (one bar); one cup borax; one cup washing soda. my husband and I LOVE it. it leaves the clothes smelling fresh (esp as we usually air dry our clothes outside because we’re in Australia) and gets out all our stains. we can’t STAND commercial laundry powder anymore, how it smells, how it feels, ew. I might consider using vinegar in the rinse cycle as an additional deodorizer, especially with summer nearing! I never thought that dissolving the ingredients in hot water first might make it work better, but I’ve found my powder recipe to be great even though I generally use cold water. Might give it a try anyway though! I made this soap, but used half of the recipe since I didn’t have a 5 gallon bucket. I used half a cup of each ingredient including a half bar of zote soap. I’m washing my clothes at the laundrymat and there are no suds at all. Does anyone know if it that’s ok, or should I have used a whole bar of soap? We have tried other home made soap recipes and did not like them . We made this recipe we LOVE IT. Why is there a need for pure water. Can’t you use plain water or filtered water? I have used a recipe that is similar, but didn’t use baking soda before. I just made this and I think I will love it! Thanks for all of your help and recipes! Love, love , love your website. 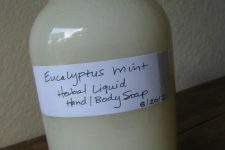 I just mixed up my first batch of this using Dr. Bonner’s baby mild castille bar soap. I added a few drops of lavendar and melaleuca oils for scent, and they also have antiseptic properties of course. I only ran into a couple little bumps along the way. 1 – when I added the baking soda after I melted te soap it foamed up and over the pan, even though i was stirring. Once I started adding the washing soda and other ingredients most of the foam went away. 2 – no matter how much I stirred all the powders in the quart of hot water, there were clumps. I did manage to get rid of them, when started adding my 2 gallons of water I kept most of the clumps in the pan and heated part of that water with them and used a whisk until they all unclumped, then poured that into the mixture in the bucket and whisked until all the clumps dissolved. Then finished adding the 2 gallons of water. There is about an inch of foam on top of the mixture in the bucket, not sure if I should be concerned, or if that will incorporate once it sits for 24 hours. Also, do you stir it during that 24 hours, or just leave it completely at rest? Thanks for the recipe! Can’t wait to try it tomorrow!!! Hi folks… I’m new at this, but have done quite a few experiments already. This is my first time with the liquid. I have used the recipe with grated bar soap, borax and washing soda – dry. I had the same experience as others with this. It totally separated… WATER ON THE BOTTOM AND TOO THICK ON TOP. I’m going to use it anyway hoping that shaking it every time I use it will just work. I won’t do it again. I’m sticking with the dry. I’ll just mix it with how water as others have suggested. It did not gel…not even a little bit. I’ve added a bit more borax and washing soda. I made a quarter of this recipe for detergent, in case something didn’t work out, or I didn’t like it. Since I had the soap stew already from another recipe, all I had to do was add the borax, the two sodas, and the water, and mix. I am happy to report that this recipe is working out very well – even though the gelling isn’t consistent throughout (i have get clumps throughout liquid), it cleans VERY well. I don’t have the borax. It is difficult to purchase in my country. Does it work without it? What is it good for in this recipe? Thank you! My daughter and I made laundry soap yesterday for the very first time and we ran into a couple of problems. If anyone out there is familiar with these problems, can you tell us what we did wrong? First, after we got all the ingredients into the 5 gallon bucket, stirred it and put the lid on loosely, we came back to find suds flowing out of the bucket! We had to scoop all the suds up and did this several times, as the suds kept growing. Second, after sitting for 24 hours, the soap has not thickened. Is the soap still usable? I don’t want to use it if it will not be effective. Thanks for anyone that can help me. How big is your bar of Castile soap? Also, I made bar soap yesterday, but when I did a “test”, dissolving some of it in hot water, there was oil floating on the top. What did I do wrong? Also, the recipe I followed did not say to heat it once it was thick. Would this solve the oily problem? the blogosphere. Short bbut very accurate info… Many thanks for sharing thos one. Hello-love your soap recipes. One question: I have a batch of homemade powdered laundry soap mixed up already (as in 4oz bar soap,1 cup each washing soda and borax) Could I put the whole shebang into hot water to make it into liquid laundry soap?